Hi i need you advice .i am going to put my eggs into the incubator very soon . And it states in should be set at 38 but you are saying 37.5 please help . 37.5 is the correct temperature – but if it’s a still air incubator (no fan) then there is stratification and to get 37.5 at the centre of the egg, you often have something like 39 degrees at the top of the egg. It’s hard to say – they may just be late so I would keep fingers crossed. I think embryos are killed as you get to the high 38 / early 39 degrees but hopefully your eggs haven’t got that high. 43 degrees is too high and will have killed the embryos. Hopefully it’s the display that’s incorrect and it hasn’t really been that temperature. I need some advice I have a couple egg in my incubator they will hatch tomorrow there eggs sacs are still small but than I have two eggs who’s air sacs are large like they are support to be what do I do should I pop a little hole in the shell above the air sac or what please help thanks. If they run over, you could put a small hole in the shell above the air sac but you risk drying out the membrane if it is too soon. Hi we have a chicken sitting on eggs, my question is I can hear a cheeping noise, does this mean they are about to hatch. As it was louder on Saturday and much quieter today. There is also a smell of rotten eggs, do I just leave them in the nest until we are lucky enough to have chicks, or how would We be able to tell them apart. Yes, chicks will cheap inside the eggs sometimes and start to communicate with the mother hen when hatched under a broody. The rotten smell is a bad egg or eggs -they can explode in the incubator, contaminating everything with bacteria so you should normally remove eggs that aren’t fertile when candling, you may still be able to do this later on before the hatch and you can often see ouzing of fluid from bad eggs. 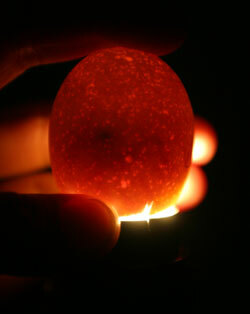 Candling before hatching doesn’t show much but you can see black where the chick is and light where the air sac is. If you twist the egg back and forth gently, you may be able to see the contents of a bad egg swishing around. hiya what does it mean when my chicken eggs start to shake at day 21 ? It means the chick is moving around which they will do as they try to break free of their shell. Black Copper Marans’ seem to have a hard time breaking through their shells which are very thick. We had to rescue one of ours who was stuck because he had managed to twist his leg behind him. A gentle bath in warm water solved the problem and he is now a fine healthy bird. We take our chicks out of the incubator after they have dried a little and put them into a nice warm brooder. They seem to get stressed if left too long in the incubator. As for not needing to eat for twenty four hours all our chicks have been hungry and crying soon after hatching and have happily tucked in to chick crumb once they were shown what to do and I think you forgot to mention that they need to drink. Gently dip their beaks in to water they soon get the idea. Usually the shell only sticks to them if you have the humidity incorrect. Or if you open the incubator too often (open only once a day to remove DRIED chicks). If you open the incubator to often you remove the humidity causing the chick to become stuck to the membrane. This could also be why he was having a tough time. Chicks can actually live in the incubator for up to 3 days without food or water and it will do them absolutely no harm. They do not need to be shown how to drink. Chickens are intelligent birds and as long as there is some available they will find it. Well, there is something wrong somewhere! You need to check the eggs you buy are OK, at what point do they die – are the chicks developing? Are they dead mid-term or early into incubation? Check the temperature and humidity on your incubator are calibrated. 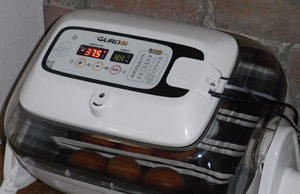 For example whilst it may read the correct temperature, it may be too hot which would kill the embryos fairly early on. My daughter’s teacher would like to have some of our chicken eggs to hatch in her classroom. I’m new at having chickens and not sure about transporting them. Should they be kept at certain temperature until delivered? Anything else I should know? 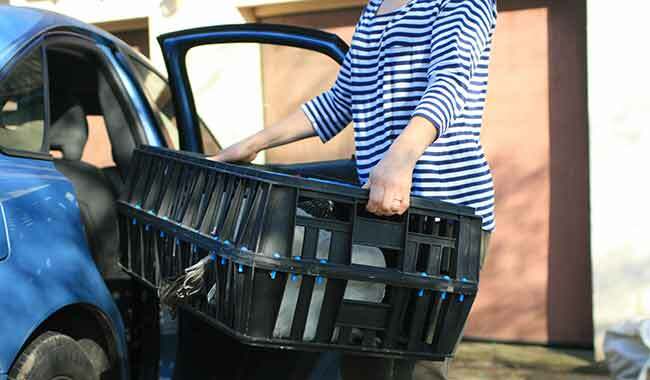 If you collect the eggs, store them in egg boxes, pointed end down in a cool place (I use a garage but a utility room or similar would do). Prop the box up at one end so the eggs are tipped at 45 degrees. Alternate the side that’s propped up morning and night so that the eggs are tipped through 90 degrees in total. This stops the yolk from settling and sticking to the inside of the shell. You can save eggs for about a week or so before taking them in to school.